Background: Human herpesvirus type 6 (HHV-6) is associated with roseola infantum during childhood followed by life-long latency that periodically reactivated in immunocompromised individuals . In spite of several studies to establish the pathogenic role of HHV-6 in lymphoid malignancies, the issue is still controversial. Objectives: This study was arranged to explore the association of HHV-6 infection in lymphoid malignancies using different serological and molecular techniques and to quantify the plasma viral load. Patients and methods: This cross-sectional case control study was conducted in National Center for Hematological Diseases (NCHD) at Al-Mustansiriyah University and Baghdad Teaching Hospital (BTH) in Baghdad-Iraq from September 2013 till April 2015. The patient group consists of 11 patients with Hodgkin lymphoma and 39 Non-Hodgkin's lymphoma of both sexes. The age range was between 15-80 years. The diagnosis of lymphomas was based on hematological and histopathological criteria. 59 apparently healthy individuals were enrolled as control group. They were chosen from unpaid blood donors. The age range was between 18-59 years. Human privacy was respected by taken participant's oral consensus. The seropositivity rate of anti-HHV-6 IgG and IgM antibodies were detected by enzyme linked immunosorbent assay (ELISA) and indirect immunofluorescent test (IFAT). The molecular detection and determination of plasma viral DNA load was achieved by quantitative polymerase chain reaction (qPCR). All data were statistically analyzed, and P values < 0.05 were considered significant. Results: The anti-HHV-6 IgG positivity rate by IFAT was insignificantly higher in HL (81.8% vs 61.0% p=0.186) and NHL (64.1% vs 61.0%, p =0.758) compared to control group. The anti-HHV-6 IgG positivity rate by ELISA was 81.8% in HL, 84.6% in NHL versus 72.9 % in controls which were insignificant in both groups (p=0.534 and p=0.173) respectively. The anti-HHV-6 IgM positivity rate by ELISA technique among patients with HL was significantly higher compared to controls (27.2% vs 6.8%, p= 0.038), but not significant in NHL (17.9% vs 6.8%, p= 0.086). HHV-6 DNA was detected in (27.3%) patients with HL by PCR technique, but none of the controls or NHL patients was positive. The plasma viral DNA load of the patient with HL was 1.4± 0.3 x105 copies/milliliter. Conclusion: Although a higher anti-HHV-6 antibodies positivity rate among patients with HL and NHL, the pathogenic role of the virus in the development of these malignancies was difficult to be ascertain. Background: Chelation therapy which is needed to prevent or reverse iron overload may also affect renal function in patients with hemoglobinopathy. The early indicator as well as predictor of nephropathy and glomerular damage among patients with sickle cell disease and thalassemia is microalbuminuria (MA). Objective: This study was aimed to estimate the frequency of MA in patients with thalassemia and sickle cell syndromes who were taking deferasirox and to find if any relationship between the level of MA and other parameters like age, gender, type of hemoglobinopathy, serum creatinine and ferritin levels. 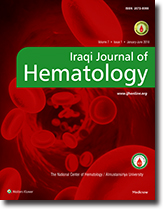 Materials and methods: This is a clinical study in hemoglobinopathy patients that taking deferasirox (oral iron chelator) in Center For Hereditary Blood Diseases (HBDC) in Basrah during the period between April 2013 and February 2014. The informations were took from patients by a questionnaire form and urine samples were collected from each patient for measurement of microalbuminuria by Enzyme-linked immunosorbent assay method (ELISA) and blood samples for biochemical tests including serum creatinine and ferritin. Results: In this study, 100 patients were 38 males and 62 females with mean of age was 25.74±10.59 years. MA detected in 31 patients and it was more among males (36.8%, 37.0 mg/ml) as compared to (27.4%, 26.0 mg/ml) of female and more in sickle cell syndrome (35%, 35.0 mg/ml) as compared to (25%, 24.0 mg/ml) of thalassemia patients and more in patients with age <30 years (35.5%, 35.5 mg/ml) as compared to patients with age ≥ 30 years (16.7%, 22.0 mg/ml). There was no significant relationship between MA and serum creatinin or serum ferritin levels but significant relationship was found between MA level and age. Conclusion: In conclusion, the study might reflect the relatively low prevalence rate of MA among non- protienuria, deferasirox-taking patients with hemoglobinopathies in Basrah. Microalbuminuria affected by many factors including age, gender, diagnosis and other factors. Background: Deep venous thrombosis is a common disorder associated with significant morbidity, chronic venous insufficiency as well as fatal pulmonary embolism. venography has been the gold standard of diagnosis, however it has been replaced in most areas by duplex ultrasound which is generally very good method .An interesting new approach to the diagnosis of DVT is D-dimer testing, D-dimer levels reflect the amount of lysed, crossed-linked fibrin and may be useful diagnostic marker in the clinically suspected DVT .D-dimer can be measured either quantitatively by ELISA or qualitatively by latex agglutination. Objectives: The aim of the study was to evaluate the use of D-dimer in exclusion of the diagnosis of DVT. Patient and methods: A total of 50 patients presented to vascular outpatient department with clinical suspicion of DVT have been studied ,patients with old DVT ,patients on anticoagulant, and patient with severe infection or inflammation were excluded .Venous duplex ultrasonography of the affected limb or limbs was done and citrated blood sample was analyzed for D-dimer by a VIDAS method for all patients blindly to the results of venous duplex .Sensitivity ,specificity, negative and positive predictive values were calculated .ROC curve then was generated from sensitivity and 1 _ specificity values at a continuum of D-dimer level to determine the optimal cut-off level of VIDAS D-dimer for exclusion of DVT. Results: The mean age of DVT group was 43 year. DVT was confirmed in 37 patients (74%), and excluded in 13 patients (26%) by venous duplex .The mean D-dimer level in the DVT group was 5498.021ng/dl while in non DVT group was 1906.384ng/dl this difference was statistically significant (P=0.0003). The sensitivity , specificity , negative and positive predictive values of VIDAS method at cut-off points(500 and 900) ng/dl were ( 100% , 33% , 100% , 82% ) respectively ,and at 3000ng/dl ( 71% ,75%, 47%,90% ) respectively Conclusions: VIDAS D-dimer method is a sensitive method that can be used in the initial management of deep vein thrombosis if a level of 900ng/dl is used as a cut-off point for exclusion of deep vein thrombosis. VIDAS D-dimer method is not a specific test so it cannot be used for the diagnosis of deep vein thrombosis. Background: There exists ignorance of blood groups among many people and surprisingly even among the literates. Despite the importance of this health parameter in blood transfusion, it is also one of the requirement of obtaining driving license and national identity card. Objectives: The objectives of this study were to determine the frequency of the blood grouping (ABO) and Rhesus (Rh) factor of the blood groups and to determine the awareness on the importance of blood grouping among the study's population Subjects and methods: The total number of sample size of this study was 278 students were selected randomly. The study was carried out among two cohort of student's population. First cohort was 168 medical students from Faculty of Medicine, while second cohort included 110 non-medical students from Baquba Technical Institute' students. The study samples have their blood groups determined according to that documented before. While those who don't know their ABO & Rh blood grouping marked as DK. Results: The result of this study shows that the rate of blood grouping were 25.5%, 22.3%, 32.0%, 6.1%, and 16.9 %, for blood group A, B, O, AB, and DK respectively ;while for Rhesus factor blood grouping the results revealed that the rates were 77.0%, 6.1% and 16.9%, for positive, negative and DK respectively. Conclusion: The blood group O with Rh positive was the most common prevalent among the selected groups, Knowledge of blood group distribution is important for clinical studies, for reliable geographical information and for forensic studies in the population. Background: Acromegaly is a disease characterized by growth hormone and insulin like growth factor hypersecretion due mostly to pituitary somatotropic adenoma. The diagnosis of Acromegaly is usually delayed for years exposing patients to slowly evolving chronic complications. Objectives: To explore the value of performing peripheral blood examination as routine work up in monitoring Iraqi patients with Acromegaly. Patients and Methods: This study was conducted on 38 patients with Acromegaly attending the national center for diabetes research and management. Peripheral blood indices were done by hematological analyzer and blood film stained by Gemisa stain for proper cells morphology done at hematological unit in Iraqi center for cancer and genetics research. Results: The patients examined showed higher values compared with control group in platelets indices (MPV and PDW) that were statistically non-significant. The monocyte count was significantly lower in patients compared by control group (p <0.05).Two patients were found to suffer from thrombocytopenia. One male with mild thrombocytopenia, the second is female with moderate thrombocytopenia. One female with moderate iron deficiency anemia. Conclusion: Peripheral blood exam in patients with Acromegaly is highly indicated, low cost and valuable in follow up patients. This study demonstrates the favorable effects of Iraqi wild type Lycium barbarum active component as an immunomodulation agent. The fruit of Iraqi Lycium barbarum is rich with Polysaccharides, which were investigated qualitatively and quantitatively in the present study. The extracted polysaccharides total content calculated, as glucose was 3.4mg/g dried fruits. The Immunomodulation effect for the extracted polysaccharides on normal human peripheral blood lymphocytes showed an increasing in lymphocytes proliferation significantly when it tested by MTT assay. The immune stimulating effect of the polysaccharides extract caused alteration in both IL-10 and TNF-α levels. After 2 hours of exposure to the extracted polysaccharides at concentrations (250 and 500 μg/ml), the normal human blood lymphocytes showed an elevation in IL-10 level against TNF-α level while the apposite results developed after 4 hours of exposure and both estimations were done by ELISA technique. Babesiosis is a tick - borne zoonotic disease transmitted by the intracellular protozoan from genus Babesia. Infection with is uncommon and symptomatic disease is mostly confined to splenectomized patients. It may be transmitted by blood transfusion. In splenectomized patients, the disease has an acute onset and is often fatal. Unsplenectomized patients may experience a milder self - limiting disease, although intravascular hemolysis does occur. The diagnosis is made from the peripheral blood film, where the parasites, looking very similar to malaria, are seen inside the red cells. In this case report, we describe a child with unexplained hemolytic anemia with presumptive diagnosis of autoimmune hemolytic anemia treated with Steroids and immunosuppressive treatment with no response. After review of his investigation, surprisingly, his peripheral blood film revealed Babesiosis.